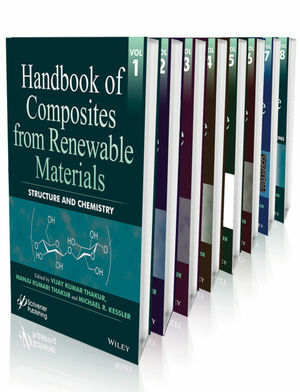 The Handbook of Composites From Renewable Materials comprises a set of 8 individual volumes that brings an interdisciplinary perspective to accomplish a more detailed understanding of the interplay between the synthesis, structure, characterization, processing, applications and performance of these advanced materials. The handbook covers a multitude of natural polymers/ reinforcement/ fillers and biodegradable materials. Together, the 8 volumes total at least 5000 pages and offers a unique publication. 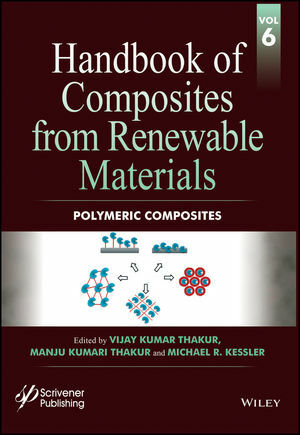 This 6th volume Handbook is solely focused on Polymeric Composites. Some of the important topics include but not limited to: Keratin as renewable material for developing polymer composites; natural and synthetic matrices; hydrogels in tissue engineering; smart hydrogels: application in bioethanol production; principle renewable biopolymers; application of hydrogel biocomposites for multiple drug delivery; nontoxic holographic materials; bioplasticizer - epoxidized vegetable oils-based poly (lactic acid) blends and nanocomposites; preparation, characterization and adsorption properties of poly (DMAEA) – cross-linked starch gel copolymer in waste water treatments; study of chitosan crosslinking hydrogels for absorption of antifungal drugs using molecular modelling; pharmaceutical delivery systems composed of chitosan; eco-friendly polymers for food packaging; influence of surface modification on the thermal stability and percentage of crystallinity of natural abaca fiber; influence of the use of natural fibers in composite materials assessed on a life cycle perspective; plant polysaccharides-blended ionotropically-gelled alginate multiple-unit systems for sustained drug release; vegetable oil based polymer composites; applications of chitosan derivatives in wastewater treatment; novel lignin-based materials as a products for various applications; biopolymers from renewable resources and thermoplastic starch matrix as polymer units of multi-component polymer systems for advanced applications; chitosan composites: preparation and applications in removing water pollutants and recent advancements in biopolymer composites for addressing environmental issues. Vijay Kumar Thakur is a Lecturer in the School of Aerospace, Transport and Manufacturing Engineering, Cranfield University, UK. Previously he had been a Staff Scientist in the School of Mechanical and Materials Engineering at Washington State University, USA. He spent his postdoctoral study in Materials Science & Engineering at Iowa State University, USA, and gained his PhD in Polymer Chemistry (2009) at the National Institute of Technology, India. He has published more than 90 SCI journal research articles in the field of polymers/materials science and holds one US patent. He has also published about 25 books and 33 book chapters on the advanced state-of-the-art of polymers/materials science with numerous publishers, including Wiley-Scrivener. Manju Kumar Thakur has been working as an Assistant Professor of Chemistry at the Division of Chemistry, Govt. Degree College Sarkaghat Himachal Pradesh University, Shimla, India since 2010. She received her PhD in Polymer Chemistry from the Chemistry Department at Himachal Pradesh University. She has deep experience in the field of organic chemistry, biopolymers, composites/ nanocomposites, hydrogels, applications of hydrogels in the removal of toxic heavy metal ions, drug delivery etc. She has published more than 30 research papers in peer-reviewed journals, 25 book chapters and co-authored five books all in the field of polymeric materials. Michael R. Kessler is a Professor and Director of the School of Mechanical and Materials Engineering at Washington State University, USA. He is an expert in the mechanics, processing, and characterization of polymer matrix composites and nanocomposites. His honours include the Army Research Office Young Investigator Award, the Air Force Office of Scientific Research Young Investigator Award, the NSF CAREER Award, and the Elsevier Young Composites Researcher Award from the American Society for Composites. He has more than 150 journal articles and 5800 citations, holds 6 patents, published 5 books on the synthesis and characterization of polymer materials, and presented at least 200 talks at national and international meetings.